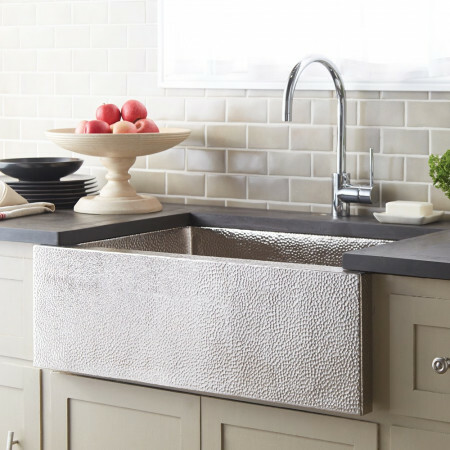 Classic hand-hammered beauty with modern sensibilities – that’s Pinnacle. 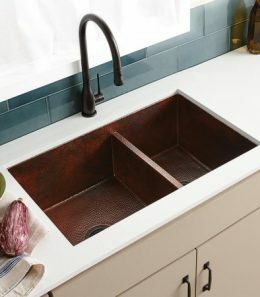 This modern copper farmhouse sink is a dramatic, contemporary take on the traditional farmhouse sink, boasting an angular full apron front and single basin. 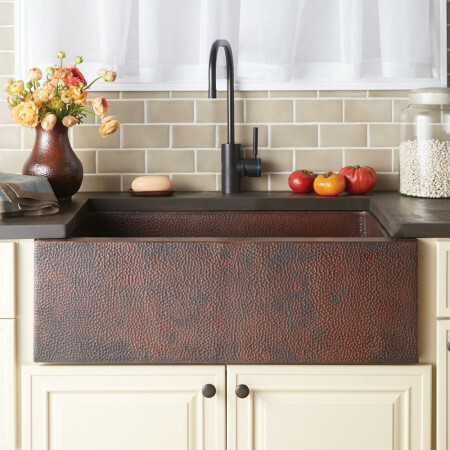 Pinnacle is an artisan crafted apron front sink, forged of high-quality recycled copper. Want to benefit from the bacteria-fighting power of copper? Studies show that uncoated copper can fight the growth of many bacteria which cause food poisoning, colds, and flu. 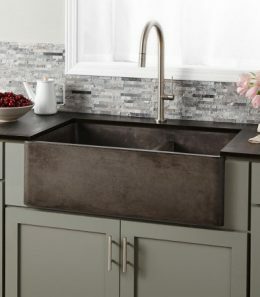 Features Single bowl 9-1/4-inch depth 10-1/4-inch apron No faucet holes Faucet not included Drain sold seperately Crack, stain and scratch resistant Material lightweight concrete Installation Undermount. Apron front and concealed front Coordinating products Drains: DR320 or DR340 Bottom Grid: GR2614 Documentation Limited Lifetime Warranty Installation Sheet Care & Cleaning Specifications Important: Due to the handcrafted nature of this product, it will vary in finish, texture, and other details. Dimensions may vary up to 1/4" (6mm). We recommend waiting for the actual product before making installation cuts. 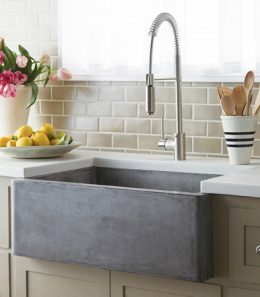 Features The Renzo pullout faucet simplifies life in the kitchen with a touch of a button. Seamless design and attractive styling makes Renzo a perfect complement to any kitchen decor. 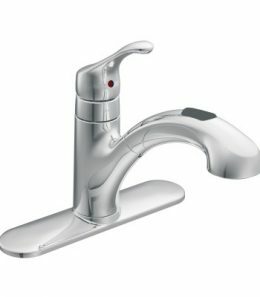 faucet pullout hose offers flexible water delivery and hose retracts with ease chrome finish is highly reflective for a mirror-like look that works with any decorating style features Duralock™ quick connect system for easy installation one-handle lever handle makes it easy to adjust the water powerful rinse for heavy-duty cleaning; aerated stream for everyday cleaning complies with Americans with Disabilities Act (ADA) specifications meets current legislation, including ab1953 (california) and s152 (vermont) limited lifetime warranty Power Clean™ spray technology provides 50 percent more spray power versus most of our pulldown and pullout faucets without the Power Clean™ technology.